A low voter turnout for the May 22, 2018 primary runoff elections in Harris County. 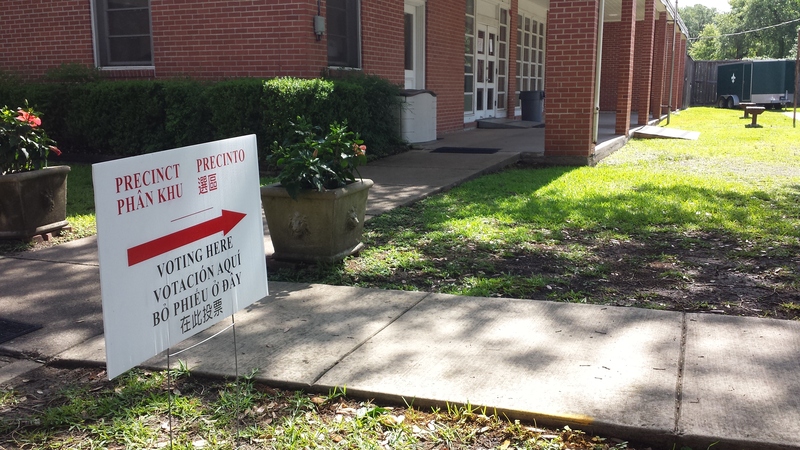 Voting was slow Tuesday morning at Christ Church Presbyterian Fellowship Hall in Bellaire, Texas. The Harris County Elections Division reports 2.54% (57,237) voters cast ballots in the Democratic runoff primary. Some 2.25% (50,716) voters cast ballots in the Republican runoff primary in the Houston area. Here is a partial list of the unofficial results from the May 22, 2018 Democratic and Republican Primary Runoff Election in Texas and Harris County with 100% of the precincts reporting. Former Dallas County Sheriff Lupe Valdez will face incumbent Republican Governor Greg Abbott in the November 6, 2018 Election. Fraga had 69 more votes in this tight judges race. This entry was posted in Asian Community Houston, Elections and Politics, National News and tagged Houston May 22 2018 Primary Runoff Results, Texas May 22 2018 Primary Runoff Results. Bookmark the permalink.